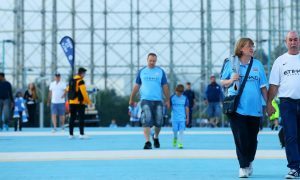 This has been proven false over and over – Manchester City has a long and storied history going back to the 1800s. Few videos give us a look into yesteryear like one shot 84 years ago today on Tuesday 1 May, 1934. On the weekend preceding this event, City had won the FA Cup for the first time in 30 years with a 2-1 win over Portsmouth at Wembley Stadium. Two late goals by Fred Tilson sent the City half of the 93,258 fans home happy. Then on the Tuesday, a homecoming was held in Manchester with scores and scores of proud Mancunians welcoming Wilf Wild’s men home – a team that included Matt Busby, Frank Swift, Eric Brook and captain Sam Cowan. “Over a million people” attended the homecoming according to the narrator as the team paraded the FA Cup through the streets of Manchester before attending a ceremony. On 14 May, the modern day heroes will retread some of the footsteps of that 1934 team when the new Premier League champions have their own parade. The video, which you can view below, also had the first City song ever captured on tape: “Who said City couldn’t play, City couldn’t play football?”.